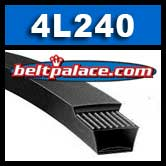 4L240 FHP V-Belt. 1/2” W x 24" Overall Length. Industrial Grade. GATES 6824/4L240 Truflex V Belts. Harbor Freight/Central Machinery Model 60564 Woodworking Band saw belt. *SHORT BELT*. Standard Duty replacement for Troy Bilt-MTD 754-04094/954-04094 belts. 4L230 FHP V-Belt. Consumer Brand. 1/2” W x 23" Length. Replaces Classical A21 V-Belt on light duty applications.